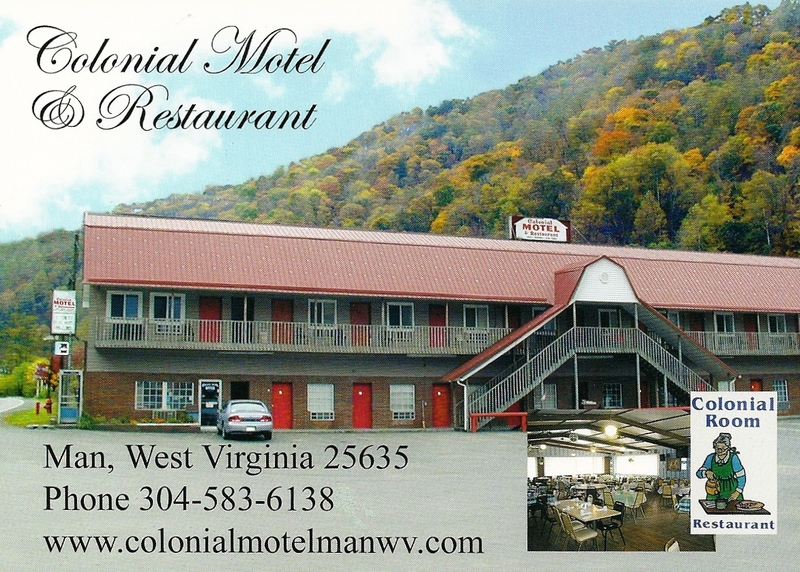 The Colonial Motel has twenty-two rooms situated on a large three acre lot adjacent to the Guyandotte River in Man, WV. The Colonial Restaurant, in the Motel complex, for your convenience, offers home cooked meals from 5:30 A.M. until 9:00 P.M. daily. The Convenience Store, also on the Motel grounds is open from 8:00 A.M. until 11:00 P.M. daily to supply all those little extras you need when away from home. Hatfield McCoy trail rider permits are available in the convenience store. The Bar and lounge is open from early in the day until late each night and has all West Virginia Lottery games. The Colonial Motel is less than one half mile from the Hatfield McCoy Rockhouse Trail Head. Our large parking lot will accommodate trucks and ATV trailers. Within one mile of the Colonial Motel are four gas stations, two supermarkets, three banks with twenty four hour A.T.M.s, four pharmacies, and four medical clinics, one with dental and eye care. Car washes, garages with mechanics and ATV repair, in addition to other facilities, are all within five miles of the motel. Everything you need for a comfortable stay is close by. In addition to the Hatfield McCoy trails, within a short drive are additional recreation facilities for your entertainment. These include: Chief Logan State Park, the most visited state park in West Virginia, and the Larry Joe Harless Center, with exercise facilities as well as a large indoor pool and movie theaters. There are various other facilities nearby. We are located just one and one half hours south of Charleston and one hour and fifteen minutes west of Beckley.